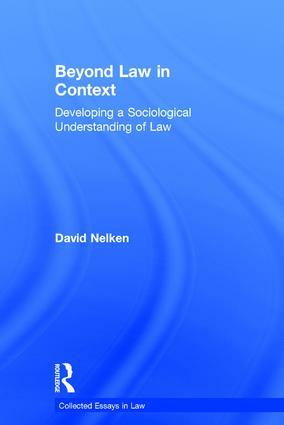 This intriguing collection of essays by David Nelken examines the relationship between law, society and social theory and the various ideas social theorists have had about the actual and ideal 'fit' between law and its social context. It also asks how far it is possible to get beyond this mainstream paradigm. The value of social theorising for studying law is illustrated by specific developments in substantive areas such as housing law, tort law, the law of evidence and criminal law. Throughout the chapters the focus is on the following questions. What is gained (and what may be lost) by putting law in context? What attempts have been made to go beyond this approach? What are their (necessary) limits? Can law be seen as anything other than in some way both separate from and relating to 'the social'? The distinctiveness of this approach lies in its effort to keep in tension two claims. Firstly, that social theorising about legal practices is vitally important for understanding the connections between legal and social structures and revealing what law means and does for (and to) various social actors. The second point is that it does not follow that what we learn in this way can be assumed to be necessarily relevant to (re)shaping legal practices without further argument that pays heed to law's specificity. Contents: Introduction; Part A Only Connect: The 'gap problem' in the sociology of law: a theoretical review; Law in action or living law? : back to the beginning in the sociology of law; Is there a crisis in law and legal ideology? ; Legislation and its constraints: a case study of the 1965 British Rent Act. Part B Changing the Questions: Beyond the study of 'law and society'? ; Changing paradigms in the sociology of law; Criminal law and criminal justice: some notes on their irrelation; The loneliness of law's meta-theory; Are disputes between law and science resolvable? ; Can law learn from social science? Part C Finding the Limits: Can there be a sociology of legal meaning? ; Blinding insights? The limits of a reflexive sociology of law; Comparatists and transferability; The meaning of success in transnational legal transfers; An e-mail from global Bukowina; Index. David Nelken, Distinguished Professor of Sociology, Macerata University, Italy, Distinguished Research Professor, Cardiff University, and Visiting Professor of Criminology in the Oxford Law Faculty, UK. Dr Nelken is the recipient of the ISA-RCSL Adam PodgÃ³recki Prize 2011, for outstanding achievements in socio-legal research, in the form of distinguished and outstanding lifetime achievement.